As a seminarian, I’ve unsurprisingly found ways to incorporate my studies into unique and applicable ways in my work at the CCCU. For example, I recently took a course on the practices of vocational formation – a concept that is pretty common and deeply important on CCCU campuses. But I took it while also learning Greek. One of the first words I learned is πνεῦμα (pneuma), which can mean Spirit, wind, breath, or inner life. 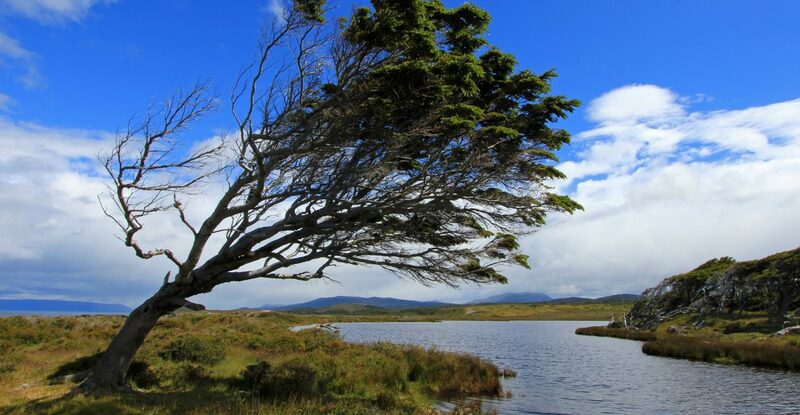 Jesus uses this word in reference to both the wind of the storm outside and the Holy Spirit when he’s talking with Nicodemus in John 3; the Sep­tuagint also uses the word in Ezekiel 37 when the prophet has a vision of dry bones coming to life by the winds and the breath of the Lord. This has prompted me to think about vocation in an entirely new light. How would I live differently if my vocation was centered around my breath – if I were inhaling God’s spirit and exhaling his power through my work and life? Suddenly, breathing as I write an email, have coffee with a colleague, interview a campus leader on the phone, or craft this essay takes on an entirely new purpose. It’s a reminder of the immediacy of God’s presence; a reaffirmation of his power in our lives. Our ordinary, everyday interactions are powerful opportunities to connect with and share God’s power. Much of the content of this magazine has been shaped in that light. What does it look like for we as Christians to breathe in the Holy Spirit in all areas of our own engagement with the world? To that end, Houghton College president and historian Shirley Mullen reminds us how and why the U.S. came to be a uniquely pluralistic culture (at least in formation if not always in practice) and why it is vital for CCCU graduates to be ready and able to engage. What if we were aware that the presence of the Holy Spirit fills us as we engage in conversations around hard topics? We look at a number of CCCU institutions with programming that is structured in such a way that students can engage with the difficult questions of the day with humility, honesty, and confidence. We also have included social psychologist Jonathan Haidt’s talk from the 2018 CCCU International Forum; Haidt’s research on the foundations of morality across cultural and political divides provides a valuable tool. So, too, does Baylor University’s Alan Jacobs with his book How to Think: A Survival Guide for a World at Odds, excerpted and reviewed. The CCCU’s study abroad programs provide students an opportunity to breathe in the Holy Spirit as they hone their passions and studies in a unique context away from campus and engage a perspective and curriculum rooted in the Christian faith. Such an experience also has an impact on the professors and administrators leading the program, as CCCU president Shirley V. Hoogstra shares in her column and CCCU vice president Rick Ostrander details in his essay. Today, one of the greatest questions we face as Christians centers around the term “evangelical.” How do we carry out God’s vocation in our lives in the midst of this? An interview with Mark Labberton, president of Fuller Theological Seminary and editor of the new essay collection Still Evangelical?, explores the impact of our social location, the importance of our commitment to the work of Jesus Christ, and the role that Christian higher education can play in all of it. Historian Molly Worthen’s talk from the Forum explores the power of historical context in engaging the next generation of evangelicals (whether they use that term or not). 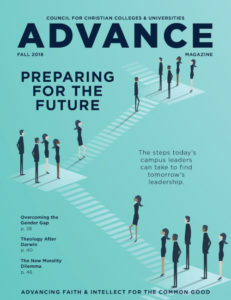 As always, we appreciate your feedback on the content we include in each issue of Advance – we want this to be a tool that helps you in your own vocation as you exhale the πνεῦμα of God in your own work. Have comments on these articles or ideas for a new one? Email me at editor@cccu.org.